I know so many of us are in it. And Isaac, Helene, Barijat, Joyce, and Mangkhut. We’re in a swirl of hurricanes, typhoons, tropical depressions of the real and metaphorical. Those of you who are regular readers of this blog already know that I am in the process of getting broken and remade by life. Life. She just does that, sometimes. When we are in the process of getting utterly reshaped by our desires, sometimes the Divine serves up heaping steaming platters of transformation, not just an hors d’oeuvre tray. Right now I am at an all-you-can-eat buffet. Not just the fact of my moving (BTW, anyone seen my socks? ), major staff changes, but, a family member is in intensive recovery in another state (doing so well, thank goddess), and just a few days ago, I found out that my boyfriend has to go in for major surgery. This week. After smoking a cigarette (and I’m not even a smoker but I suddenly needed one) and weeping, I had to run and meet a girlfriend. A sister. My pal. And it was perfect timing. I was able to just lay it all out and let it all out, telling her everything. The main area of my concern was that I had arranged to fly across the country to tend to my family member, but now my boyfriend was heading in for his surgery. Should I cancel the flight? Abandon the boyfriend? Or abandon the family? What to do, what to do, what to do? She said one word to me that changed everything: tribe. I caught on immediately. We are sisters. We have sister power. All of us, siblings to each other. We have community. And with her holding space for me, I could hold space over all that required me. We jumped in her car, and drove over to my boyfriend’s apartment. And we sat with him in his vulnerability and simply sister-powered him. We collected the names of friends who could be with him as he waited for surgery, came back from the operating room, and began to recover. We put together a list of all the relevant questions to ask the doctor and the pre-op nurse. We made a plan, people. A plan that did not decimate one individual caregiver, but, rather, included our whole community in his recovery. This was even better than me being able to be in two places at once. Peter was going to get a chance to experience just how loved he is. Just how much people care about him. Actually, he is going to be the treasured guest at a two-week long party in his honor. Suddenly, this insurmountable task of caregiving was not just lifted off my shoulders, but elevated to high art. The joy of life is not simply in serving oneself. The true joy of life is in being able to be a part of a larger community of service, taking one another higher. I am so thankful for the sister-friend who reminded me how beautiful it is for people in community to be invited to serve, to care, to tend, to be needed by one another. Right now, I want you to think about a friend/family member/sister in your life who you love and want more for. If you could give her anything in the world what would it be? Would you want her to feel surrounded not only by your love, but by the even larger love of sister power? Do you want her to feel held and gotten? Rooted in who she is, and where she’s come from, and where she’s going? Would you want her to feel surrounded by the support of sisterhood, community, and connection? And have loads lifted from her shoulders? This is possible for her, even in the midst of life’s storms. This is my work. You have a chance to invite her to join you at The Womanly Arts Experience in New York City, Dec. 1 and 2. This is an event that I deliver for the love of sisterhood. 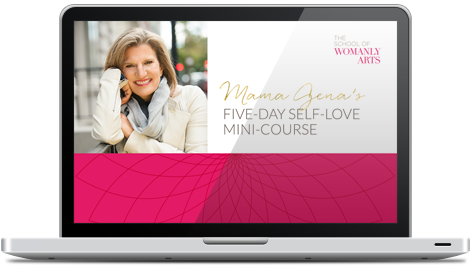 I wanted to reach inside the body and soul of all women, and provide the roadmap of true connection. I want this for all the women I know, and for all the women I don’t know. This is how I serve. As poet Adrienne Rich said, “The connections between and among women are the most feared, the most problematic, and the most potentially transforming force on the planet.” We need to remember our strength and reconnect with our vibrant selves and each other — not only to assist the evolution of this planet as a whole, but, for each of us, individually to feel inspired enough to continue to go for it — whatever it is — despite the obstacles. Things are changing so quickly right now. Seemingly lurching both forward and backwards at the same time. Rains are pouring down and winds are strong. Sisterhood has us rise above, transform, and alchemize the darkness into hope. I need you to be as big, blazing and radiant as you can possibly be. Because the more of your light you step into, the more of mine I can inhabit and embody. By standing in my own sacred radiance, I open up room for you to stand in yours — way beyond the boundaries of what you or I can imagine. Step into this new paradigm with me. Give the gift of sisterhood, connection, love. Reach out to a woman you love. If you’re called, if you’re curious, come to The Womanly Arts Experience. Let me show you what I mean. Let me introduce you to sisters who will hold you and yours too. Beyonce, Paris, and the messy truth of creation. How the hell is this my life?